Percutaneous coronary intervention or PCI) is carried out in a similar fashion to an angiogram. The procedure is carried out with the patient awake but often with some sedation. It is necessary to be starved beforehand. A small tube is placed in an artery in the groin or wrist. An injection is given to thin the blood. A catheter tube is then passed up to the heart arteries. A few pictures are taken of the heart arteries after which a fine wire is then passed through the catheter and down the narrowed artery. A balloon catheter is then passed over the wire and into the narrowing. The balloon is inflated to stretch the artery and improve blood flow. This is commonly combined with the use of a stent, which is a metal mesh scaffold that remains in the artery to keep it open. Angioplasty Step 1 - Shows narrowing in the right coronary artery. Angioplasty Step 2 - A wire is passed down the artery and stent positioned across narrowing. Angioplasty Step 3 - Stent is expanded by inflating the balloon. Angioplasty Step 4 - Balloon is removed leaving stent in place. Artery is no longer narrowed. Flash videos require Adobe Flash Player. 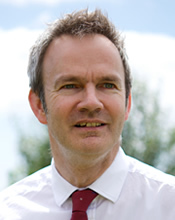 What are stents and what do they do? Two broad main groups of stents - bare metal and drug eluting - are used. Drug-eluting stents are coated with a drug that helps to prevent the artery from re-narrowing. The choice between these two types of stents depends on a number of factors including the size of the artery and length of the narrowing. If a stent is placed in an artery then patients are treated with special tablets (clopidogrel) to prevent a blood clot from forming on the stent. These additional tablets are very important. Stent - A stent is a metal mesh-like scaffold that is used in coronary balloon angioplasty to hold the artery open. 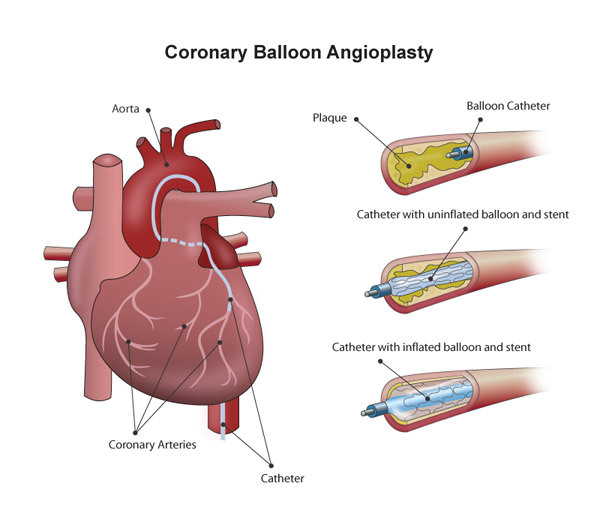 There overall risk of balloon angioplasty is less than 1%, which means that less than one in a hundred patients will have an adverse outcome such as a heart attack. Rarely the artery may be damaged necessitating coronary artery bypass surgery. This is necessary in about 3 or 4 patients in 1000. Primary PCI refers to the immediate use of a balloon and stent to stretch up a blocked or narrowed artery that is causing a heart attack. It is the preferred treatment option in this situation and has replaced the more traditional use of clot dissolving drugs administered through a vein (thrombolysis).